If you come by here often you know that there is orange blood in my family. However, you are also aware that this fact doesn't keep me from bold predictions and putting the flags at full Glory in their territory. The Georgia-Clemson rivalry can cause some family tension certain Fall seasons, but it also allows me to sit in the middle of their endzone sea of orange every now and then and watch Greene and Pollack dismantle their team 30-3. So I'm thrilled that this rivalry appears to be saved for the 2013-14 season openers. To celebrate I want to use this edition of GATArchives to remember one of the greatest (if not THE greatest) game between the two programs. 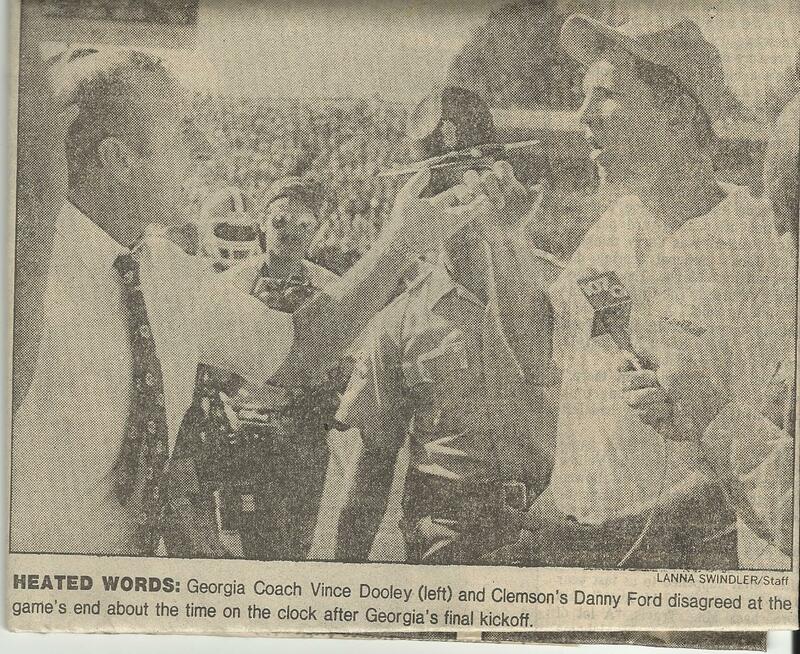 It was the day Sanford Stadium became worse than bonkers. It's known for Kevin Butler's miraculous and momentous 60 yard game winning kick that went 100,000 miles. Georgia beat the #2 ranked Tigers 26-23 after trailing by two touchdowns at halftime. Here are some important notes from the game. Georgia gave the ball away three times in the first half on interceptions, but Tiger QB Mike Eppley accounted for five second half turnovers (and seven total for the game with three INTs and four fumbles, holy crap!) in helping the Dawgs climb back into the game. William "The Refridgerator" Perry was limited to seven tackles. When asked what the Dawgs did to neutralize him he claimed it was anything but blocking him. "Tripping, holding, clipping. But I don't think they blocked me." On the other side Georgia center Pete Anderson had a different take: "I was exhausted but [Perry] was more tired. We were in better condition. I think they should have rested him at times." Although it's the 60 yard FG that everyone remembers, it was Tron Jackson's 24 yard run on a '23 Draw' late that set up the kick. Both coaches pretty much agreed the turning point of the game was Georgia's first possession of the 2nd half. The Dawgs drove 70 yards and quarterback Todd Williams found Herman Archie on a 19 yard score. Another unsung hero of the game was punter Chip Andrews who averaged 47.5 yards on 4 punts. Context - #20 Georgia beats #2 Clemson 26-23 after some confusion at the end of the game. So, Butler's kick gives the Dawgs a 3 point lead with 11 seconds left and in the chaos of celebrating Dooley's team is assessed a 15 yard penalty. Ford's Tigers tried a cross field lateral on the ensuing kickoff that appeared to have fooled Georgia momentarily, but eventually the Clemson ball carrier was forced out of bounds at the Georgia 35. The controversy came when it was uncertain as to whether there was a penalty on the kickoff and if there was one second remaining when Roulhac went out of bounds. After a brief conference officials determined that the ballgame was over. Quotable: Ford on the final play - "I would like to have discussed it with officials but I couldn't find one. I thought there was one second left, and I thought there was a penalty, and I thought a game couldn't end on a penalty. I don't know if they made a mistake or not, and I hope I don't find out I was right." And...Ford on what he was thinking on Butler's kick - "That he would miss it. Seriously, I knew he had the leg and knew he had a chance. That ball must be flat now. He kicked the fool out of it." Lastly...Defensive Coordinator Bill Lewis on where the win ranked in his experience - "If it's not No. 1 then it's No. 2. But I haven't been in a more exciting game I don't think." Back to the centerfield confrontation, Ford hinted that he didn't realize it was Dooley in front of him when he was yelling after the game. He later went to the Georgia locker room to apologize for the heated exchange. It was a tight contest that went down to the last minute. We've all seen games that even when they are over the emotions are still high and pandemonium seems to grab hold at least momentarily. Regardless of how it ended, it's evident that this was just another chapter in what is a storied and tense rivalry. Perhaps the greatest chapter of all if you ask Dawg fans. I was there... Can't even begin to tell you how exciting that moment (and the moments leading up to the "kick")were. Definitely makes my top five. Man, wish I had found that before that Citrus Bowl post. I'll add that to Monday's Meatloaf. Thanks! You OLD folks got all the really cool games. I got Goof. Thanks, BD, good memories! This old dawg was there too! I still believe after the kick, Sanford Stadium was the loudest I have ever heard it! I am so glad UGA will be playing Clemson again. They are in my neighborhood. I can't wait to ride on my boat again from Georgia to Tigertown to cheer on the Dawgs!! We appreciate you defending the banks of Lake Hartwell! Go Dawgs!